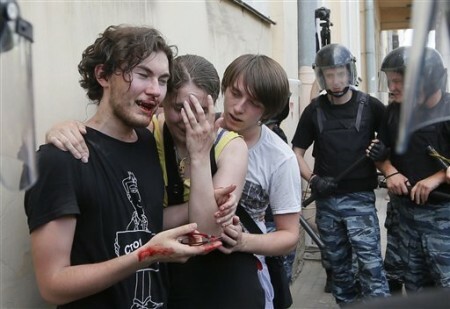 In this June 29, 2013 photo, riot police (OMON) guard gay rights activists who have been beaten by anti-gay protesters during an authorized gay rights rally in St.Petersburg, Russia. NEW YORK — The advocacy group Human Rights Watch released a video Tuesday documenting the increased violence against LGBT Russians. “The Russian authorities have the power to protect the rights of LGBT people, but instead they are ignoring their responsibility to do so,” said Tanya Cooper, Russia researcher at Human Rights Watch.